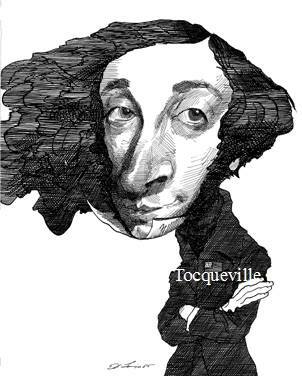 Tocqueville saw the rise of industrialism in Europe and America along with the impoverishment and subordination of the industrial workers. To lift the agricultural peasantry out of poverty and subjection, he recommended the spread of land ownership to the agricultural workers. And then he carried over the same idea to the industrial working class. All quotes are from the 1837 Second Memoir on Pauperism (trans. Christine Dunn Henderson). While Tocqueville thinks that the capitalists should make such gifts in their own interest, he finds little inclination for them to do so. While he hoped for this ultimate form of industry, he didn’t think the time was ripe in his own time (1837). “Nevertheless, I am led to believe that a time is approaching when a large number of industries might be run in this manner. As our workers gain broader knowledge and as the art of joining together for honest and peaceful goals makes progress among us, when politics does not meddle in industrial associations and when government, reassured about their goals, does not refuse them its benevolence and its support, we will see them multiply and prosper. In democratic ages like ours, I think that associations of all sorts must gradually come to take the place of the commanding action of a few powerful individuals. Tocqueville could only think of workers having more savings as a way to finance the purchase of companies. He unfortunately did not anticipate the modern form of finance such Employee Stock Ownership Plans or even lease-purchase arrangements where the purchased asset is used to generate the income to pay for it. Tocqueville’s suggestion of savings accounts to implement his classical-liberal/civic-republican philosophy (use government to empower people to do good things for themselves) by workers getting “an interest in the ownership of the factory” was not “ripe” in his time, but institutional innovations have made employee buyouts a viable strategy for widespread empowerment in our own time.